A boy who was left with brain damage after being starved of oxygen at birth has been awarded millions of pounds in compensation. The High Court heard the 11-year-old, who cannot be named for legal reasons, suffered asphyxia while being delivered at Queen's Medical Centre, Nottingham. He developed cerebral palsy and severe disabilities as a result. 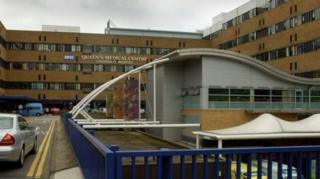 Judge Patrick Moloney QC has ordered Nottingham University Hospitals NHS Trust to pay a lump sum of £2.72m. The trust - which settled with the family to pay 80% of the claim - must also pay him £60,000 a year until he reaches 19 years old, which then increases to £102,000 a year for the rest of his life. Simon Taylor QC, representing the boy, said his client's life expectancy was about a decade lower than an uninjured person's. Judge Moloney praised the boy's family for having "continued to work together in the interests of their son".